Editor's note: An earlier version of this story misstated Nissan's fiscal fourth quarter net income. Historical foreign exchange rate data has also been updated. YOKOHAMA, Japan -- Nissan Motor Co. reported a 6.4 percent drop in operating profit in the just-ended fiscal year as foreign exchange losses and rising incentives undercut earnings. Operating profit declined to 742.2 billion yen ($6.67 billion) in the fiscal year ended March 31, CEO Hiroto Saikawa said Thursday while announcing financial results. Net income advanced 27 percent to 663.5 billion yen ($5.96 billion) in the January-March period. Nissan attributed the rise to a one-time gain from the sale of its stake in former group supplier Calsonic Kansei Corp., which it booked in the fiscal fourth quarter. Worldwide revenue decreased 3.9 percent to 11.72 trillion yen ($105.34 billion) in the quarter, as global retail sales increased 3.7 percent to 5.6 million vehicles. 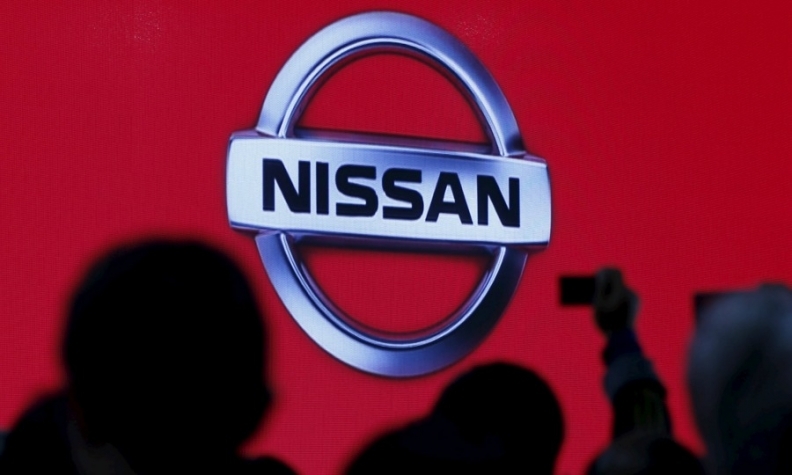 Saikawa said Nissan's core auto performance remained strong despite the earnings hit from the appreciation of the Japanese yen against the U.S. dollar and other currencies. Shifting foreign exchange rates cut some 281.9 billion yen ($2.53 billion) off operating profit in 12-month period. Nissan is fighting fluctuating exchange rates that have battered earnings across the board at Japanese automakers over the last year. Nissan's results were also held back by an increase in marketing and selling expenses totaling 258.5 billion yen ($2.32 billion), partly to cover rising incentives. Operating profit margin came to 6.9 percent at the end of the fiscal year, missing former CEO Carlos Ghosn's Power 88 mid-term business plan goal. He had targeted global operating profit margin of 8 percent and 8 percent market share by March 31, 2017. Nissan had already abandoned the market share target. It ended the last fiscal year with a global market share of 6.1 percent, down from 6.2 percent the year before. Ghosn told Automotive News, a sister publication of Automotive News Europe, in October that the company was unlikely to hit the profit margin because unfavorable foreign exchange rates were undermining results. Saikawa said that if exchange rates had remained stable from the time Ghosn unveiled the goal in 2011, operating profit margin would have finished at 8.3 percent, exceeding the target. "We did achieve this, and going forward we will sustain this," Saikawa said. Saikawa is expected to detail his company's next mid-term plan later this year. But he offered a sneak peek at certain elements, saying it would be another six-year roadmap. The first goal will be to keep Nissan cruising with an 8 percent operating profit margin, under what Nissan dubbed “reasonable economic conditions." The next will be lifting global revenue to 16.5 trillion yen ($148.30 billion) over the period, from the 12.8 trillion yen ($115.05 billion) Nissan booked in the last fiscal year, as measured under its previous method of accounting for its China business in a proportional way in earnings. Nissan will also continue to chase its 8 percent global market share goal in the next mid-year plan, Saikawa said. That should be possible, he said, if Nissan can boost its market share in China to 8 percent, from today's 5 percent penetration. "The key here is our business in China," Saikawa said. China was the biggest volume driver in the just-finished fiscal year. Nissan's sales in the world’s biggest auto market grew 8.4 percent to 1.4 million vehicles in the 12 months. But North America remained Nissan's biggest overall market, with sales expanding 5.9 percent to 2.1 million vehicles. European volume increased 3 percent to 776,000 vehicles. In the fiscal fourth quarter ended March 31, Nissan's operating profit increased to 239.0 billion yen ($2.15 billion), from 205.7 billion yen ($1.85 billion). Net income surged to 249.3 billion yen ($2.24 billion) in the three-month period, from 71.0 billion yen ($638.1 million), bolstered by proceeds of some 111.5 billion yen ($1.00 billion) from the sale of Calsonic Kansei. Revenue increased to 3.46 trillion yen ($31.10 billion) in the January-March period, from 3.25 trillion yen ($29.21 billion). Looking ahead for the current fiscal year that began April 1, Nissan expects the strengthening Japanese yen to again drag on earnings. Operating profit is expected to fall 7.7 percent to 685.0 billion yen ($6.16 billion), while net income declines 19.4 percent to 535.0 billion yen ($4.81 billion). The company sees revenue growing 3.6 percent to 11.8 trillion yen ($106.06 billion). Nissan expects global retail sales to increase 3.6 percent to 5.83 million vehicles. North American sales are expected to inch ahead 0.5 percent to 2.14 million vehicles this fiscal year, while U.S. sales advance 1.2 percent to 1.6 million vehicles. European sales will grow 2.4 percent to 795,000 vehicles, Nissan predicted. Nissan finalized its purchase of a controlling 34 percent stake in Mitsubishi last October and appointed Ghosn its chairman. At the time, Ghosn forecast nearly half a billion dollars in savings as soon as next fiscal year as the group joins a club of automakers operating at a massive scale. Mitsubishi's purchase pushed global Alliance sales 17 percent higher in calendar year 2016. Without including the smaller Japanese carmaker, sales would have advanced just 6 percent.